before the closing date of 20-08-2018. Fee payment last date online for these BPSC Block Panchayat Raj Officer jobs is 24-08-2018. 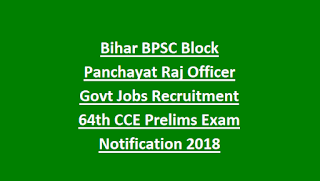 Candidate who qualified Degree they can apply online through the official website or www.bpsc.bih.nic.in for this BPSC Block Panchayat Raj Officer vacancies. 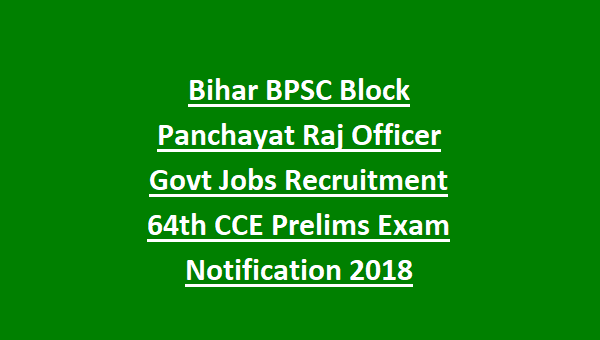 Candidates selection for this Bihar Block Panchayat Raj Officer jobs is on basis of 64th CCE Prelims Exam and Mains Exam 2018. Exam Pattern and Syllabus, how to apply, age limits, qualification and other details are given below. There are total 133 BPRO Jobs in this BPSC Recruitment. Candidates must have qualified Degree for applying this BPSC recruitment of Block Panchayat Raj Officer Posts. For General Male candidates age limits are 21-37 years. For Gen Women, BC/MBC age limits are 21-40 years and for other 21-42 years. Candidates selection will be held based on 64th CCE Pre Exam and Mains Exam marks, interview. 64th CCE Pre Exam will be objective type only. Mains Exam will be descriptive type. Candidates who are interested in these BPRO jobs they can apply online on or before the closing date. Official website to apply online is www.bpsc.bih.nic.in. 64th CCE Pre Exam Pattern, Exam Syllabus, Admit Card, 64th CCE Pre Exam Key, Exam Result and other details are available in this website only.